This frugal idea uses digital scrapbooking supplies to make fancy nails! Hybrid Chick wrote: This is a super-easy project, but it did take me a couple times to get it just right. Be prepared for that. You may have to practice a time or two to get the hang of it. Unfortunately her website is no longer available, but check out these Jamberry nail wraps on Amazon, similar idea, but less work to fit! It is neat that she put them on the paper towel roll holder! Would you use these instead of paper towels? Would you make them for yourself? Check out these Unpaper Towels/Snapkins on Amazon! 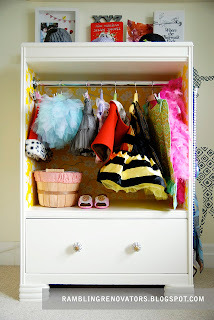 Creating a Dress-up Chest - or hand up baby clothes from an old dresser! My youngest son always had dress-up costumes laying about - this would have really helped - and looked great too! Check out these dress-up closets on Amazon!